failed to steal the machine. Only two weeks previously CEMEX had commenced installing the Kosran ECV Immobilisation Tracking System on their fleet and this was one of the first machines to be secured. But this all adds up. Insurance & Police PANIU Statistics published for the period Oct 08 – Sept 09 stated that the JCB Backhoe Loader is the most stolen machine in the UK. Wait for it - on 23rd May the thieves returned again to Glen Crowther’s CEMEX depot and tried again to steal the same machine serial number 328999/fleet number B019 without success. 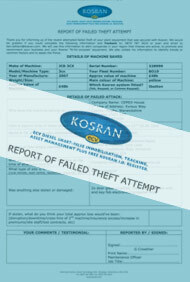 Ask FM Conway, they have been using Kosran for four years and have never had a machine stolen.